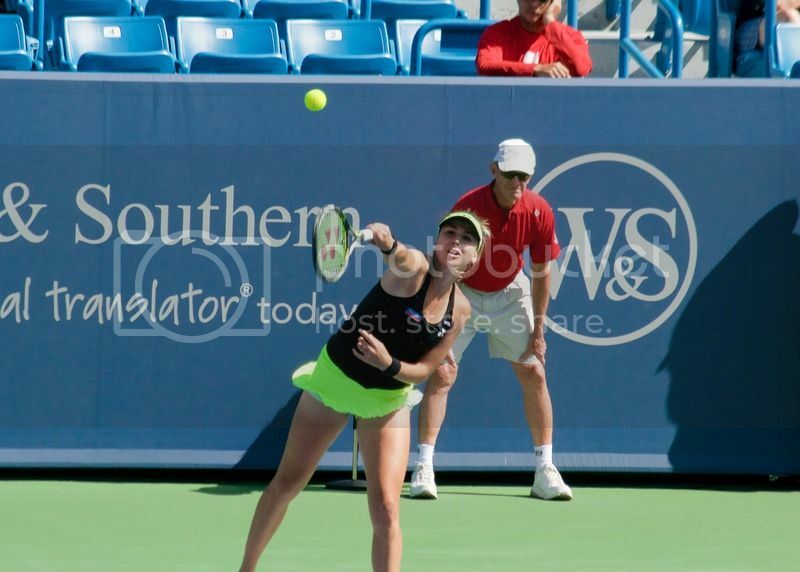 MASON – Teenager Belinda Bencic has had an incredible run of tennis over the last two weeks. On Thursday at the Western and Southern Open, her run came to an end. Bencic retired from her center court match with No. 7 seed Lucie Safarova allowing Safarova to advance to the tournament’s quarterfinal. Things looked good for Bencic early as she broke Safarova’s serve in the opening game of the match. With the first set on serve at 3-2, Bencic asked for a trainer. Safarova responded by winning the final three games of the set to win the set 6-2. Following the first set, Bencic gave Safarova a hug and walked off the court, allowing Safarova to advance. Bencic said she retired due to a right wrist injury. She said after the match that she did not think the injury was serious. Bencic has played nine matches in the last two weeks. Bencic came into the Open on a high note after winning last week’s Roger Cup in Toronto. Bencic defeated four of the top six players in the world last week, including Serena Williams in a dramatic three-set semifinal. Bencic’s loss on Thursday ended her eight-match winning streak. Down a pair of breaks in the third set, No. 1 seed Novak Djokovic was on the brink of falling short once again at the Western and Southern Open. He responded by winning his final six games over No. 13 seed David Goffin 6-4, 2-6, 6-3 to advance to the quarterfinals. When Djokoic knotted the third set at 3-all, he gave a huge fist pump to the crowd as he finished a long rally with Goffin with the game-winner. The sold-out center court crowd at the Lindner Family Tennis Center came to its feet in support of Djokovic. In a match where break points came at a premium, Ivo Karlovic matched his own tournament record with 35 aces but fell to No. 5 seed Stan Wawrinka 6-7, 7-6, 7-6. Both players’ serve was spot on as neither competitor could break the other’s serve as all three sets were decided by tiebreaks. Karlovic won 75.8 percent of the points on his serve. While Wawrinka won 71.6 percent. With Wawrinka leading the third set tiebreak 6-5 and Karlovic serving, Karlovic hit his second serve off the top of the tape as the ball flew over the service line.